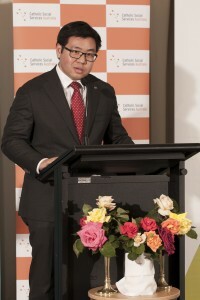 Dr Tim Soutphommasane, Race Discrimination Commissioner at the Australian Human Rights Commission. How would you organise your society if you were living behind a veil of ignorance? 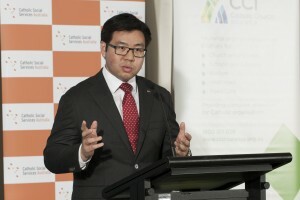 Dr Tim Soutphommasane, Race Discrimination Commissioner at the Australian Human Rights Commission asked this question of leaders gathered at the Catholic Social Services Australia National Leadership Forum held at QT Canberra Hotel last week. Would you ‘protect the vulnerable, help those in need, ensure there is a sense of justice?’, Dr Soutphommasane added. Focusing on a local story about recent protests against a place of worship, a mosque in Bendigo, he said, ‘Bendigo is a town divided because of such protests. Some residents have sought to close down this project of building a mosque. They see the religion of Islam as incompatible with Australian values and society’. 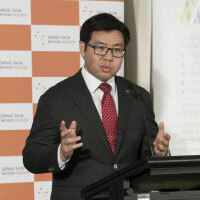 However, the Commissioner said, ‘In a multicultural Australia, we should be welcoming everyone. Everyone has a right to protest, but it’s not the same as making a campaign of intimidation’. Often this behaviour stems from fear and ignorance, he said. ‘Often in my work it’s a case of a failure of empathy, failing to understand that someone’s dignity was affected by an action or comment,’ he said. This can be a powerful demonstration of how one can be transformed to do something for others, the Commissioner said. He concluded by quoting Pope Francis and his reference to ‘simple daily gestures’ in Laudato Si’.